A Forum for Orthodox Jewish thought on Halacha, Hashkafa, and the social issues of our time. A prominent 20th century Charedi leader once said about Baltimore’s Ner Israel Rabbinic College –They specialize in ‘normal’. While I may differ somewhat with the Hashkafa of Ner Israel, I would agree that they do indeed produce the type of mainstream Charedi Jews I have called moderate. And have said about them that they will (and already have begun to) comprise that vast majority of Orthodox Jews in America. These are people who went to Charedi Yeshivos, buy into their philosophy and have nonetheless taken on many of the modalities of the Modern Orthodox world. They have for example pursued higher education for purposes of having professions and careers that will give them the kind of income that will enable them to better support their families. And they tend to also participate somewhat in the general culture. In other words they are more or less ‘normal’ by societal standards and their lifestyles are hardly distinguishable from Centrists - the more right wing element of Modern Orthodox Jewry. This is what the world of the right seems to be veering away from. They are (intentionally of otherwise) trying to ‘normalize’ behavior that is anything but normal by societal standards. I believe that the above mentioned rabbinic leader would be appalled at this phenomenon. The most obvious manifestation of this (which has been discussed here at length) is the erasure of women. A phenomenon adopted by the Charedi glossies that publish slick looking weekly magazines using high end graphics and some pretty good reporters and columnists albeit with a clear Chardei bias on everything they write. These magazines do not feature pictures of any women at all, no matter how modestly they are dressed. Not even a ‘head-shot! I believe that this is the segment these Charedi glossies wish to attract – knowing that they will not buy their magazines if there are any pictures of women in them. Now it is completely within the rights of any community to set up any standard they wish to live by… and just as acceptable for magazines to cater to those standards for purposes of increasing their bottom line. Provided it does not impact negatively on Judaism as a whole. When it does, I think it has to be protested and even fought by doing whatever can be legally done to end such practices. I have tried to do that here many times. But I have zero influence on any of these magazine to change their policy. Following my lead would in any case cost them their more extreme Charedi readership. Which happens to be the fast growing Orthodox demographic in the world! But is the bottom line always the most impotent thing a magazine should consider? Or is it how that specific bottom line mentality affects the rest of us? My answer is that although I am a big fan of ig bottom lines, some things are worth sacrificing it for. And in my view it wouldn’t be that much of a sacrifice since I believe that they will make some of their lost readership by increased Modern Orthodox readership. More importantly is that by featuring pictures of women they will be restoring normalcy to mainstream Orthodoxy. And hopefully help to change the direction other organization might be taking in order to not be ‘out-frummed’ by these glossies. 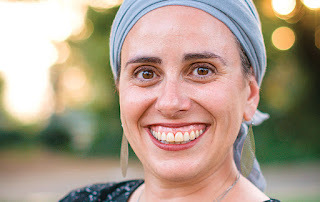 I can’t and I won’t be in a publication that has a discriminatory policy against women,” Schwab said, even though she covers her hair and is the granddaughter of the rabbi who founded Toronto’s chapter of Agudath Israel, the group that advocates on behalf of Orthodox Jewry. While Schwab acknowledged the importance of the piece, she couldn’t in good conscience accept the offer. “In Judaism there has never been a concept of a woman covering her face,” she said. “That’s not Judaism; that’s a perversion of Judaism. It’s extremism.” She added that the Torah wouldn’t mention the matriarchs’ beauty if it was immodest. I don’t know Mrs. Schwab or anything about her. But She is my new hero. She had the courage to stand up to the current spirit of the Charedi world and say, ‘No!’ To put doing the right thin’ ahead of money. Which would have been the obvious clear benefit to what would have amounted to a huge free ad in a widely circulated magazine for her new company. The next step would be for more ‘Miriam Schwabs’ to stand up and say, ‘No!’ – I am not going to participate in the erasure of woman and reject any offer to do a story on them. It would even help if men would say the same thing to them. Because that would clearly affect their bottom line of enough people did that. And if they would change their policy, it might just be the first step - tiny though it may be - in restoring normalcy to the mainstream. 1. Fill in your name or an alias. Do not leave blank or use the name 'guest' or 'anonymous'. 2. No Nivul Peh. Profanity will be deleted. 3. No personal attacks. Be kind in your comment even if you disagree. Unless specifically stated I do not necessarily endorse products or services advertised on this blog. My outlook on Judaism is based mostly on the teachings of my primary Rebbe, Rabbi Aaron Soloveichik from whom I received my rabbinic ordination. It is also based on a search for spiritual truth. Among the various sources that put me on the right path, two great philosophic works stand out: “Halakhic Man” and “Lonely Man of Faith” authored by the pre-eminent Jewish philosopher and theologian, Rabbi, Dr. Joseph B. Soloveitchik. Of great significance is Rabbi, Dr. Norman Lamm's conceptualization and models of Torah U’Mada and Dr. Eliezer Berkovits who introduced me to the world of philosophic thought. Among my early influences were two pioneers of American Elementary Torah Chinuch, Rabbis Shmuel Kaufman and Yaakov Levi. The Yeshivos I attended were Yeshivas Telshe for early high school and more significantly, the Hebrew Theological College where for a period of ten years, my Rebbeim included such great Rabbinic figures as Rabbis Mordechai Rogov, Shmaryahu Meltzer, Yaakov Perlow, Herzl Kaplan, and Selig Starr. I also attended Roosevelt University where I received my Bachelor's Degree - majoring in Psychology. Sexting - Did She or Didn’t She? Harry Maryles. Picture Window theme. Powered by Blogger.